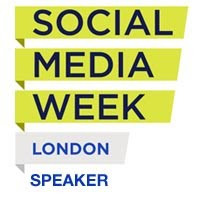 Finally, the content you post on Facebook is set to become a whole lot more shareable thanks to the introduction of a snazzy new, easy to use feature called Facebook Embedded Posts. Yep, you read that correctly. For some reason there's a glitch that stops the code from working on a Wordpress site. I'm sure that a fix will found in the next few days, but in the meantime. 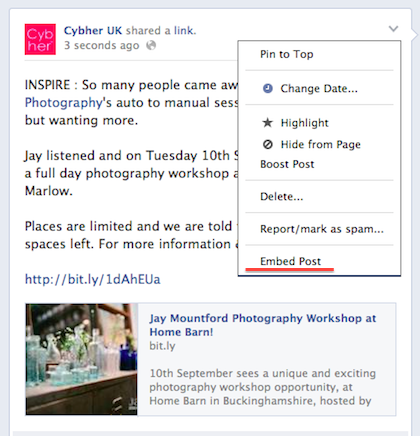 Follow this step by step guide on How To Use Facebook Embedded Posts on your blog or website. Go to the Facebook Post that you'd like to embed. 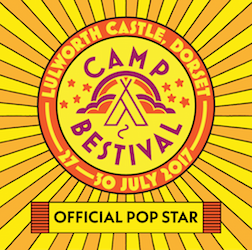 Hover over the top right corner of the post and a grey arrow will appear. Click on the arrow and scroll down to EMBED POST. 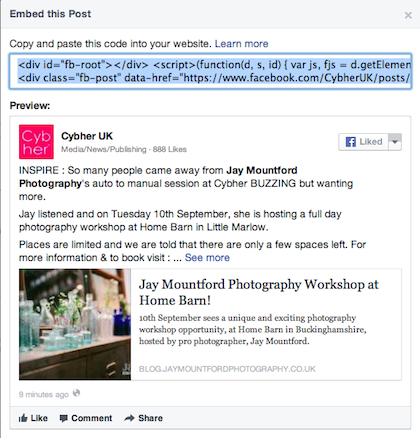 Hop over to your blog and paste the code where you would like the Facebook Embedded Post to appear. And that's it. Blogger -1 Wordpress - 0.